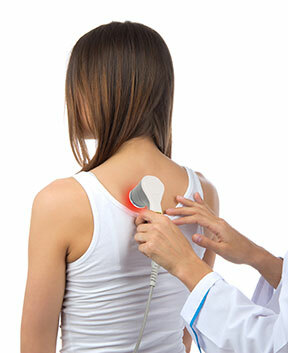 infrared Light Therapy is an effective therapy method used to relieve pain and accelerate the self­-healing process. It is essentially a deeper form of electrical stimulation. To perform this method of treatment, electrodes are placed on the skin around the injured body part. An Interferential Current device is then used, which transmits electrical impulses in minute quantities throughout your skin. Underlying tissue and nerves become stimulated which begins the healing properties. These impulses are not painful, and can be described as a minor prickle on the skin.